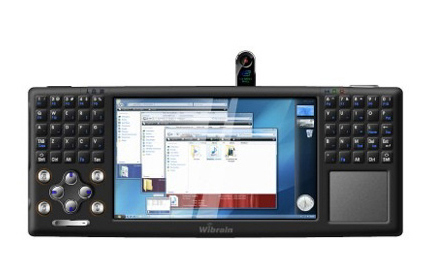 Eking i1 (Was Wibrain i1) UMPC Available from Mobilx. Price. We mentioned a few weeks ago that the Wibrain i1 was being re-born as the EKing i1 and that some people had ordered via Ebay. [Their first impressions and discussion here.] We also managed to collect comments from a number of people that wanted to order the Eking i1 through a group order. Based on that (we like to think!) Mobilx, the ever UMPC-loving resellers from Hungary have negotiated a shipment and price. 513 Euros (including EU taxes, about 430 Euro for exports) will buy you the i1 with the 1.33Ghz CPU, 1GB RAM, 60Gb drive and the big 5hr+ battery life. Unfortunately the device is without 3G. Update: Note that the price is excluding Windows XP. Having done a lot of testing with the Wibrain prototype version of this I can tell you that not only is the battery life huge but the usability is fantastic. The mouse pad is superb and the keys are slightly improved over the B1 version that Wibrain sold in 2007/8. You’ll have to put up with 500gms of weight, a non-pocketable form factor and, lets be honest, not the most stylish of designs but its excellent value. Mobilx EKing information and order page. Timescales should be 2-4 weeks but keep an eye on the Mobilx info page for more details on that. WiBrain i1 becomes reallity as E-King i1. Ebay purchase report. I’ve had unconfirmed and insider reports for months now that Wibrain (or rather NeoSolar, the owners) had sold the WIbrain operation to China-based E-King. 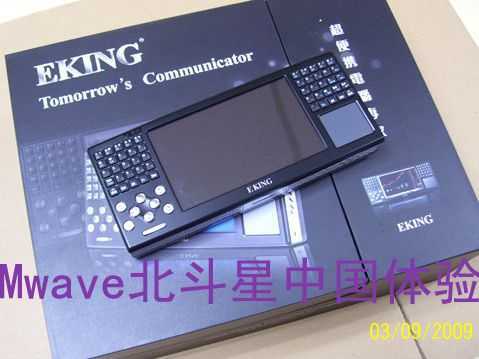 The E-King website has been up for a while but it now looks like they’ve gone into production and are starting to sell the E-King i1 UMPC. That pretty much confirms all the rumors! Two UMPCPortal readers have taken the plunge and bought one on Ebay. User ‘hansonweb’ has already received it and started to feed-back first impressions. “It comes with 60gb hdd, z520 processor, 1gb memory. XP pre-installed…It came with a DVD with drivers. Hdd has two partitions, 20gb and 40gb. 40gb seems to have a restore image. The i1 is certainly a great device [my review] and at 504 Euros including delivery, the Ebay-cost (non 3G version) isn’t bad but do watch out for support issues when buying from Ebay. Returns can be costly and take a long time. I spoke with Mobilx this morning about the i1 and we couldn’t really come to a decision about whether importing it would be commercially viable. On one hand its a fantastically productive little ultra mobile PC but there’s obviously some risk where support is concerned. E-King is also unknown as far as build-quality goes. We could certainly try to put a group order together if people are ready to go forward with a purchase though. Let us know in the comments below and if there’s a lot of interest i’ll give Mobilx a call. The Eking-i1 is now in the database. 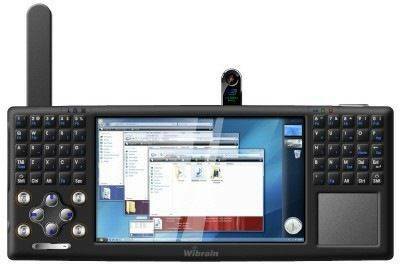 Forum – WiBrain – Eking I1 available from manufacturer and maybe on eBay within a month… – UMPCPortal.com. 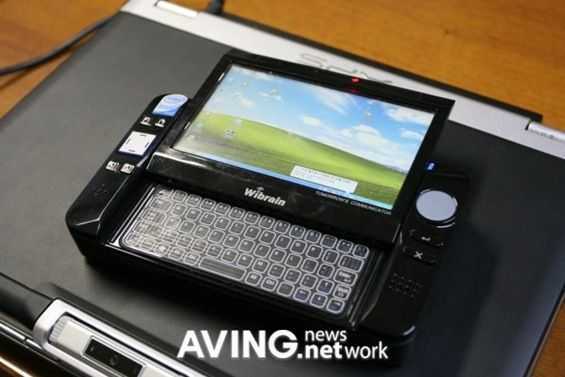 Jkk has pointed out that according to Aving, the new Wibrain M1 ultra mobile PC has left the prototype stage and will now get built for production. The new device is a handheld slider form-factor with a thumb keyboard. It’s great to see a new ultra mobile PC using this sliding form-factor, though the specs aren’t too impressive. From what we can see in the images, it looks like there may be a fold-up camera on the top of the unit like the one on the original Wibrain B1 [Product page]. There is also a USB port which has ‘Host’ written over it, so it can be assumed that you’ll be able to plug it into another computer and use it as an external HDD, though with only 8/16GB it would make for a very bulky flash drive! It looks like the unit will use a tiny trackpad to operate the mouse instead of a nub-mouse which would probably be preffered. The Wibrain M1 definitely has some tough competition in the space, going up against the entire UX series. Hopefully it will have good battery life and a quick SSD. The keyboard will probably be the deciding factor for many people, so let’s hope that it’s good as well! It doesn’t look like it in the pictures, but I’m hoping that the final production model will have a backlit keyboard. The Aving article says its for Korea but that could always change, and if it doesn’t see an international release but is still popular, I’m sure it’ll still be available through importers. Head over to jkkmobile for some more images. I’m on my way to MBC09, the microblogging conference that starts tomorrow in Hamburg so its a good opportunity to do some more testing. OQO 2+, Wibrain i1 and a mobile phone on a seat-back table. This week it’s been my great pleasure to be testing another ultra mobile PC based on the Intel Menlow platform. It’s not my first as I’ve had the Gigabyte M528, Aigo MID and Kohjinsha SC3 but there’s a couple of things about this Wibrain i1 UMPC that are worth talking about and one of them is a real first in the mobile computing world and has got me all fired-up about UMPCs again. I’m not talking about the competitive pricing, hi-res touch screen, usable keyboard or built-in 3G. I’m talking about the battery life. After delays on the WiBrain i1 and the disappearance of our usual contact-point within WiBrain, I was a bit suspicious that something was going on. Mobilx don’t have the original B1 models on offer any more and now it seems like the whole WiBrain website has been taken away. Fingers crossed that this is just a short-term problem and that we’ll see the i1 soon. In the meantime, we’ll try and find out what’s happening. Wibrain i1 shaping up to be first ‘All-day’ UMPC. One of the distributors of the Wibrain i1 has got hold of a Wibrain i1, snapped a few pics and made some comments in the forum here. 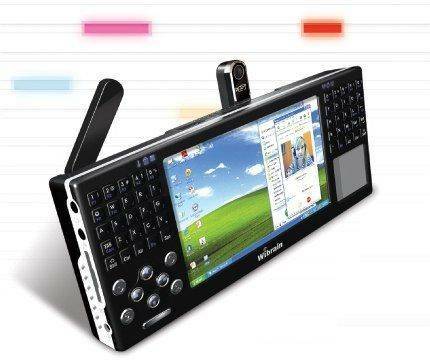 If you’re looking the the ultimate Windows XP mobility device with the best battery life and best connectivity for, potentially, a very interesting price, keep reading. The 1.3Ghz Atom-based device is based on the old Wibrain B1 design which was, quite frankly, an ugly brick to most people. There are some styling improvements which help it a little but don’t expect young geeks to be fainting at your feet when you whip it out. However, this is an action UMPC, not a flowery style-icon. It has the same easy-to-learn control layout (the touchpad is the best I’ve ever tried on a ultra mobile PC for example) and the same extremely high quality and brightness screen in a package that weighs 500gm. That’s 1.1lbs. It runs XP, has a 60GB hard drive, new SD card slot and re-positioned USB port. The real kicker is three-pronged though. 6hrs+ battery life on the standard 30wh battery, a 3G module and what looks like it could be an amazingly good price for such a setup. Wibrain claim 7hrs on the standard battery. I’ve seen 6+ on the battery meter in hands-on testing and ‘Digital’, is now reporting 6.5hrs with wifi or 3G on. In marketing terms, this is an all-day UMPC in 500gms. Final availability is still not 100% clear but early pricing indications at Mobilx look positive. 467 Euros ($600) pre tax without 3G and 532 Euros ($712) pre-tax with the 3G module. We’ll keep you updated on availability when we hear anything. More links, news, details in the Wibrain i1 information page.